BROKERAGE - We have over 40 years of experience in bringing buyers and sellers together in Ashland area real estate. Our goal is to obtain for our sellers, the highest price possible for their commercial property, or their homes, in the shortest possible time. Floyd Realty's approach to this task is refreshing, on point, and filled with the answers you most need to know in order to make a solid decision. What price is supported by the market? Are you aware of the "Corporate" Clause? What is your professional fee? What can I do to make my home more marketable and for more money? What can be done if I am not satisfied with your service? Let Floyd Realty discuss their approach with you and provide answers to the above questions and any others that you may have. APPRAISAL - David E. Floyd is a SRA member of the Appraisal Institute as well as a certified, general appraiser in the state of Kentucky. We provide appraisals for mortgage lenders, personal real estate decisions, estate settlement, and litigation. PROPERTY MANAGEMENT - If you wish to have a professional manage your property, Floyd Realty's agents can provide management services that include finding renters, rent negotiation, professionally drawn leases, property inspections and maintenance, collection of rents, and evictions if necessary. Let us take the hassle out of rental property. HISTORY - Floyd Realty and Appraisal Co., the successor to Twin Realty, was formed by E. H. (Pete) and Helen Floyd in 1958. Pete spent his professional career in sales and Helen came to the business after 28 years as office manager and aide to a local physician. After opening Floyd Realty, they acquired an insurance business to provide an additional service in the property field. They served the Ashland area real estate market until their retirement in 1973. In 1973, David Floyd, their son took over the business and he has been providing quality, professional agency and appraisal services to the same Ashland area market served by Pete and Helen. 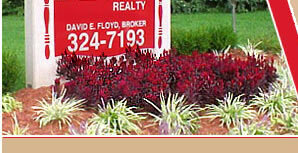 Floyd Realty has continuously served the Ashland area for 50 years and counting. Floyd Realty today is a company of professional agents dedicated to providing the highest professional quality real estate services for both buyers and sellers. We feel these qualities distinguish Floyd Realty as a dependable choice for those needing to work closely with a trained real estate professional. Copyright © 2004 | All rights reserved.